Shading between plotted lines with a light color can enhance some charts. The shading may help to indicate a target range for the data. I’ve written earlier tutorials about this topic, but I have had to change sequences of steps in the protocol because more recent versions of Excel were not as flexible with order of operations as Excel 2003 (RIP). 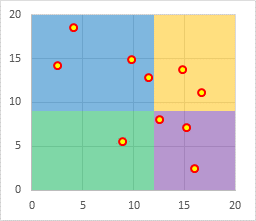 Recently in Shaded Quadrant Background for Excel XY Scatter Chart I showed how to generate a background grid of colored rectangles. 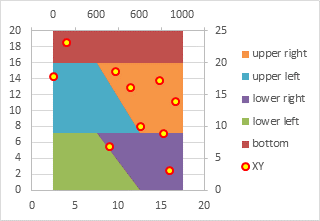 This technique plotted the XY chart data on the primary axes and the Area chart data on the secondary axes. 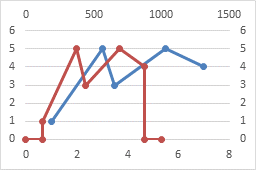 It also took advantage of a trick using the category axis of an area (or line or column) chart: when used as a date axis, points that have the same date are plotted on the same vertical line, which allows adjacent colored areas to be separated by vertical as well as horizontal lines. To fill under or between XY series, we’ll make use of this same approach: XY data on primary axes, Area data on secondary axes, with a secondary date axis. Let’s start with the simple case of filling color below an XY plot. 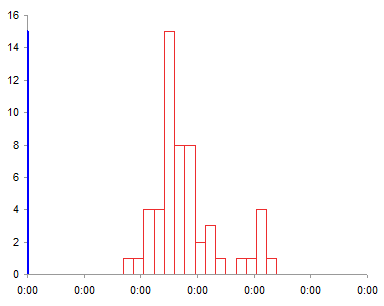 Simple data, simple chart of type Scatter With Straight Lines and Markers. We need to do some calculations to produce data for the area chart series (see below). 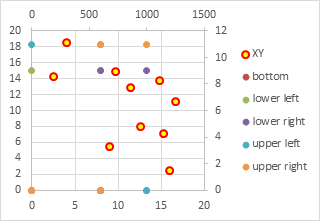 The min and max X for the XY chart’s X axis are entered in B11 and B12 (these are Excel’s automatic scale limits in the XY chart above). To provide reasonable resolution, we’ll scale the area chart’s X data from 0 to 1000. The formulas for the area chart’s X values in column D are simple interpolation formulas to properly rescale the data. The X values are extended so that the first calculated X value in D5 is repeated in D4, and a zero is placed in D3; also the last calculated X value in D9 is repeated in D10, and the X max of 1000 is entered into D11. These duplicate X values will provide the vertical edges of the shaded region. The formulas for the area chart’s Y values in column E provide the same Y values for both chart series. The Y values are extended by two cells above and below the calculations, which contain zeros. The chart already contained the XY data in the first two columns of the data range (B4:C9). Copy the next two columns (D2:E11) , select the chart, then click on the Paste dropdown on the Home tab and choose Paste Special (below left). The Paste Special dialog will appear; make sure the same settings are selected as shown below right. Here is the computed data and the chart. The added series is an XY chart type, like the first. Don’t change it yet. Select the newly added series, press Ctrl+1 (numeral one) to open the Format Series Task Pane (Excel 2013) or the Format Series Dialog (2010 or 2007), and under Series Options, select Secondary Axis (below left). Excel adds a secondary vertical axis along the right edge of the chart (below right). Excel adds a secondary vertical axis along the right edge of the chart. In Excel 2013, click the plus icon beside the chart, click on the right-facing arrow beside Axes, and check the Secondary Horizontal box. In Excel 2010 or 2007, you’ll have to trudge up the the Chart Tools > Layout tab, click on the Axes dropdown, click Secondary Horizontal, and finally click Show Left to Right Axis. Now all axes are present and accounted for. Right click on the “Area” series (which is still of type XY), and choose Change Series Chart Type. 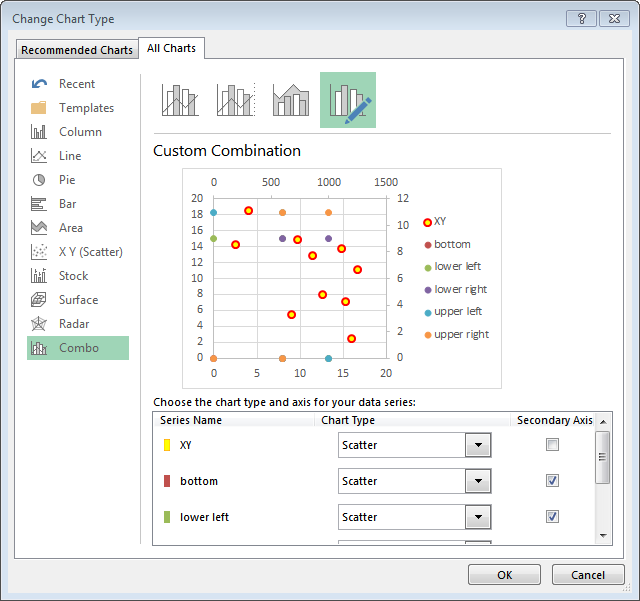 In Excel 2013, the Change Chart Type dialog appears. Click the Chart type dropdown in the Area series row, and select Area or Stacked Area (doesn’t matter which in this case, since there’s only one area series). You actually could have switched the area series to the secondary axis in this dialog (as long as you do it before changing the chart type), but I usually forget that it’s become this simple. 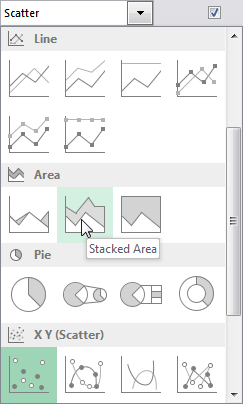 In Excel 2007 and 2010, select Area or Stacked Area from the pop-up window. The series has now been converted to an area series. Select the secondary horizontal axis (top of chart) and press Ctrl+1 to open the Format Axis Task Pane or the Format Axis Dialog. Under Axis Type, select Date Axis (below left). You may also have to change the Base Unit of the axis to Days. The area chart series is now perfectly aligned with the XY series. Since it’s plotted on the secondary axis, the area series fills the space between the secondary horizontal axis at the top of the chart and the data points. So it’s above the data, not below. But we’re clever enough not to panic. Delete the secondary vertical axis (right edge of chart) and the secondary horizontal axis (top of chart). 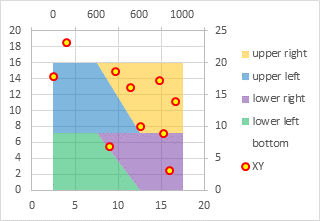 The fill moves into position below the XY plot. 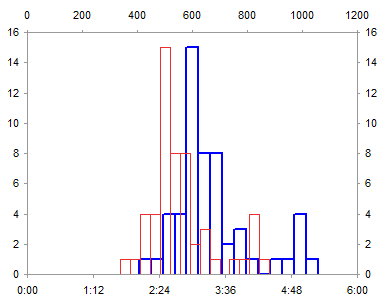 The protocol for filling between two plotted lines is pretty much the same as above. 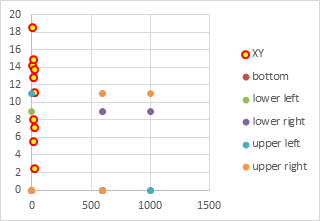 We start with two XY scatter chart series, one above and one below the filled area. We will also need two stacked area chart series, one for the clear region below the lower XY line, and one stacked on top to fill between the XY lines. 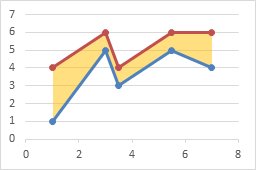 Here is the data and the initial chart for the two XY curves. It takes up space, but I’ll leave the legend there until the end to help us keep track of which series is which. 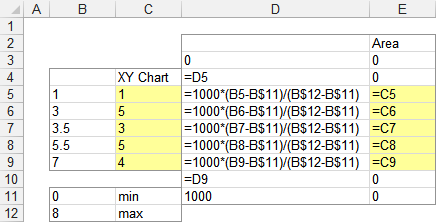 The formulas to calculate the area chart X and Y values are like those used in the simpler example above. 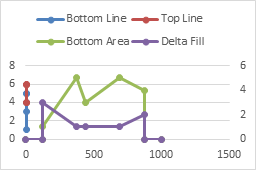 Note that the Bottom Area data is the same as the Bottom Line data, while the Delta Fill data is the difference between the Top Line and Bottom Line data. Copy the area chart data (E2:G11) , select the chart, then click on the Paste dropdown on the Home tab, choose Paste Special, then make sure the settings are correct. The new data is added as additional XY series, which is fine. Select one of the Area data series (still plotted as XY), press Ctrl+1 to open the Format Series Task Pane or Dialog, and choose Secondary Axis. Excel gives us the secondary vertical axis along the right edge of the chart. Repeat for the other Area data series. 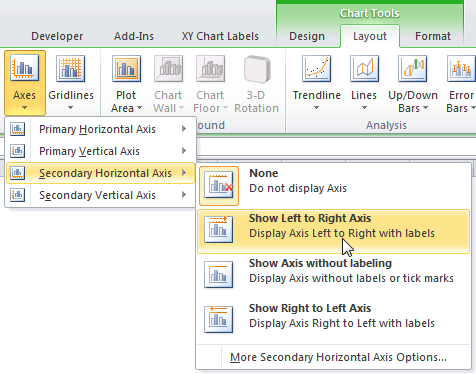 In Excel 2013, click the plus icon beside the chart, click on the right-facing arrow beside Axes, and check the Secondary Horizontal box. 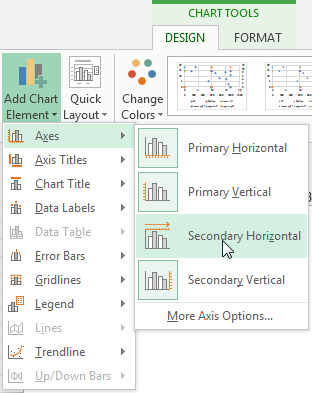 In Excel 2010 or 2007, you’ll have to trudge up the the Chart Tools > Layout tab, click on the Axes dropdown, click Secondary Horizontal, and finally click Draw Left to Right Axis. Right click on the “Area” series (which is still of type XY), and choose Change Series Chart Type. 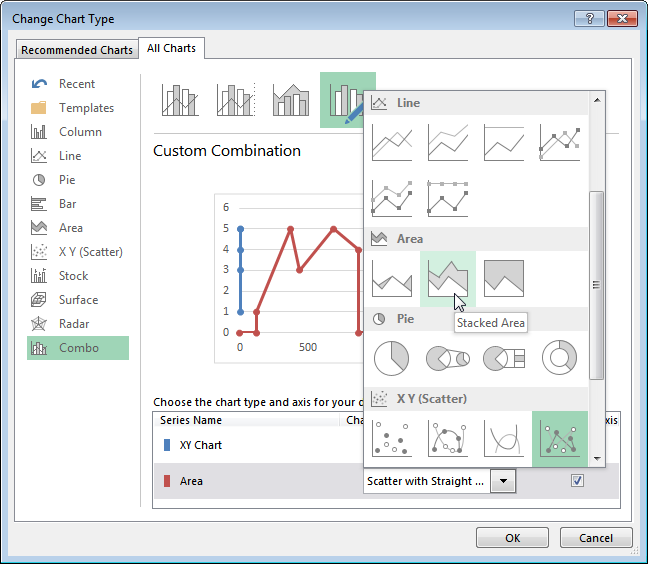 In Excel 2013, the Change Chart Type dialog appears. Click the Chart type dropdown in each of the Area series rows, and select Stacked Area. You could have switched the area series to the secondary axis in this dialog (as long as you do it before changing the chart type). In Excel 2007 and 2010, select Area or Stacked Area from the pop-up window. The chart probably looks like it’s broken right about now, but don’t panic. 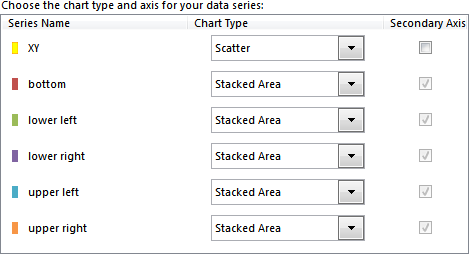 Right click on the other area series, choose Change Series Chart Type, and again select Stacked Area. Select the secondary horizontal axis (top of chart) and press Ctrl+1 to open the Format Axis Task Pane or the Format Axis Dialog. Under Axis Type, select Date Axis. The area chart series are now perfectly aligned with the XY series. Since they’re plotted on the secondary axis, the Bottom Area series fills the space between the secondary horizontal axis at the top of the chart and the Bottom Line data points. So it’s above the data, not below. The Delta Fill area has filled the space between the XY lines. Delete the secondary horizontal and vertical axes. 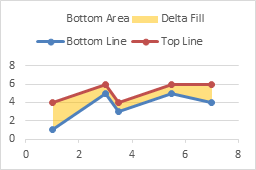 The Bottom Area now fills below the Bottom Line, while the Delta Fill fills between Bottom Line and Top Line. Format the Bottom Area series so it has no fill. It is possible to extend this approach even further. Suppose we want to fill between two pairs of lines. The following simple data has four series, min and max for set A and min and max for set B. We want to fill between Amin and Amax, and between Bmin and Bmax. If these areas overlap, we’d like to see both. We can set up the area chart data below, where we have an area below Amin (“Bottom”), one between Amax and Amin (“Afill”), one between Bmin and Amax (“Blank”), and one between Bmax and Bmin (“Bfill”). The “Blank” area between Bmin and Amax extends from Bmin down to Amax, if Bmin is greater, or from Bmin UP to Amax, if Bmin is smaller. I won’t go through the whole procedure, because it’s really the same as filling between two lines, above. The lines are shown on the left, A in blue, B in orange. The finished overlapping filled regions are shown on the right, again A in blue and B in orange. I’ve used a transparency setting of 50% so we can see gridlines and other data behind the area fills. The four charts below show each area in turn with the others hidden. 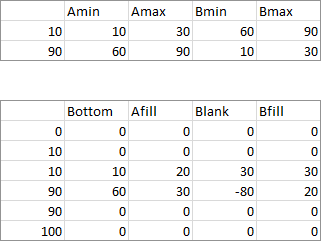 First, “Bottom” fills from the axis up to Amin, then “Afill” fills from Amin up to Amax, “Blank” fills from Amax up (or down) to Bmin, and finally “Bfill” fills from Bmin up to Bmax. Posted: Monday, September 9th, 2013 under Combination Charts. Tags: area-xy combo, background and fill. This is a rework of an older article. The protocol has been simplified and the steps reordered to work more reliably in Excel 2013 and other recent Excel versions. 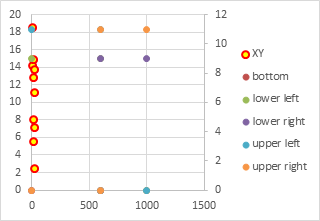 Here is the simple XY data used in this tutorial. 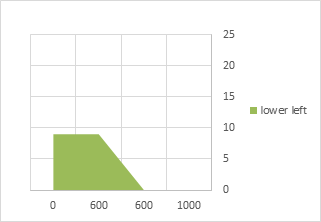 The data scales between 0 and 20 on both axes. These two tables show the data and calculations needed to draw the shaded background areas in the chart. 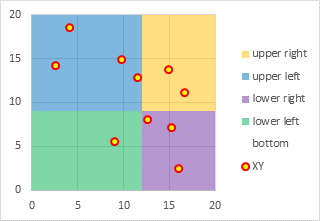 The first table shows relevant values for the X and Y axis, including the minimum and maximum, as well as where we want the divisions between left and right shaded areas and between upper and lower shaded areas. You don’t need to use such a summary table, but you might find it helpful. In this example, we want the areas to extend from X=zero (the left edge of the chart) to X=12, and from X=12 to X=20 (the right edge of the chart). Likewise we want them to extend from Y=zero (the bottom of the chart) to Y=9, and from Y=9 to Y=20 (the top of the chart). The axis parameters were selected arbitrarily here, partly to show that the quadrants don’t have to be of equal width or height. These are static values, but you could put formulas into the range C3:D5 if you wanted the divisions based on the statistics of the data or on any other variable criteria. The factor of 1000 is used in the formulas in C8:C11 simply because it will provide the appropriate resolution of the division between shaded areas. The need for the “Bottom” area series is discussed at the end of this tutorial. It may be better to wait until indicated in the middle of this protocol before you read it. Start constructing the chart by selecting the XY data and inserting an XY Scatter Chart from the Insert tab of the ribbon. The legend has been included to help show all the series in the chart through this protocol. 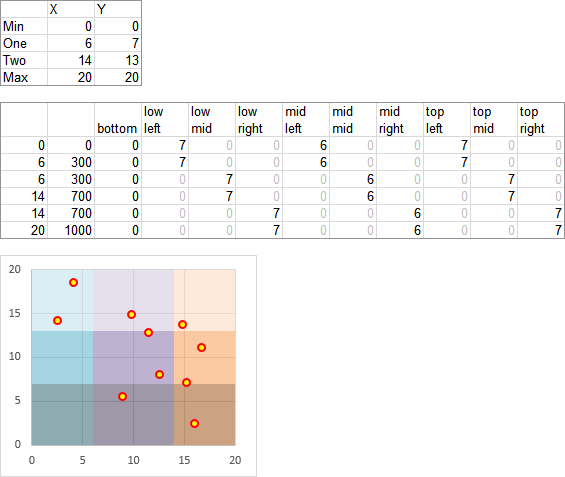 Next, copy the data for the shaded regions, which is in C7:H11 (don’t include column B, which has intermediate values). Select the chart, then click the little down-pointing triangle on the Paste button of the ribbon’s Home tab, and select Paste Special. You will see a dialog like this, and you should make sure these are the settings before clicking OK. In this case, Excel should figure them out correctly. 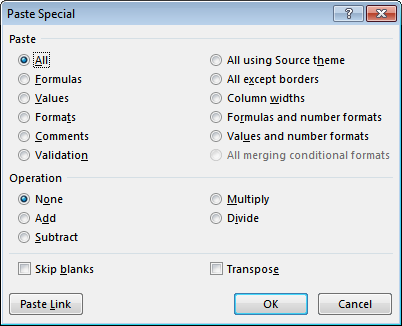 The following Paste Special dialog is for pasting data somewhere in a worksheet. 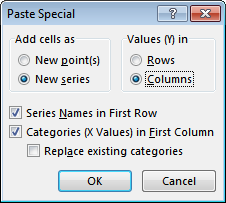 This means that a cell or cells in the worksheet were selected when you clicked on Paste Special. Cancel this dialog, select the chart, and re-invoke Paste Special. One by one, select each of the newly added series, and assign them to the secondary axis. This is the first setting you can control if you select the series and press Ctrl+1 to format it. It also can be done from the new Change Chart Type dialog in Excel 2013, shown at a later step of this procedure. 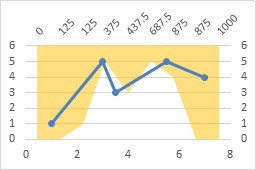 Excel has added a new vertical axis along the right edge of the chart. Add the secondary horizontal axis. 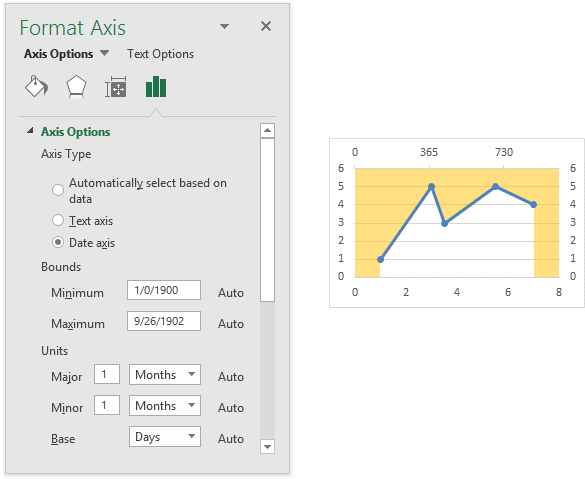 The easiest way in Excel 2013 is to click on the Plus icon next to the chart, click on the right-pointing triangle next to “Axes”, and check the appropriate box. You could also use Excel 2013’s Add Chart Element control on the Chart Tools > Design tab. 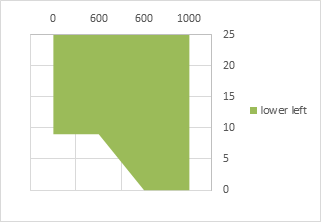 In Excel 2007 or 2010, go to the Chart Tools Layout tab, click the Axes down-pointing triangle, then Secondary Horizontal Axis, then select show Left to right Axis. Here is the chart with all four axes deployed. Now the original XY data on the primary axis overlaps with the added data on the secondary axes. Now we need to change the added series from XY to Stacked Area. This is very easy with Excel 2013’s new Change Chart Type dialog. Right click on any series in the chart and choose Change Series Chart Type… The dialog shows the chart with a list of series in the chart. 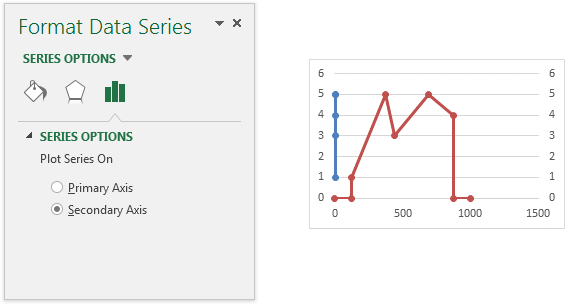 Beside each series is a dropdown showing its chart type and a checkbox showing its axis group. We could have changed the axis group of the added series to secondary in this dialog, as long as we did so before selecting a different chart type. 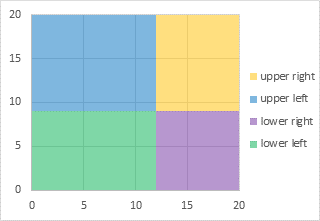 This panel shows all series in the chart, after changing axis group of the added series, but before changing their chart type to Stacked Area. Click on the chart type dropdown, and you’ll see a collection of chart types. The XY Scatter type is selected, and the cursor is hovering over the Stacked Area icon. 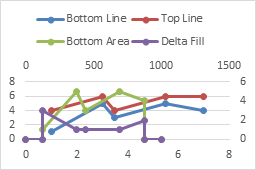 Here is the panel of chart series after changing the added series to Stacked Area. If you’re using Excel 2007 or 2010, you have to right click on each series you need to change, one at a time, and select Change Chart Type. You will see this dialog. The XY Scatter type is selected, and the cursor is hovering over Stacked Area. If you have to change one series at a time, the intermediate chart will look rather strange. 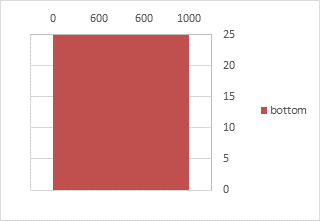 This is the chart after changing one series to Stacked Area in Excel 2010. If you only changed one series on the secondary axis in 2013, it would also look like this. But don’t panic: after changing all of the series, the chart will look the same in all three Excel versions. Here is the chart with all added series changed to Stacked Area. The need for the “Bottom” area chart series becomes evident in the chart above, with a little explanation. If you are interested, there is an explanation at the end of this tutorial. The next step is to format the area series. Here I’ve made the “bottom” series completely transparent, and applied a transparency of 50% to the rest. This tones down the intense colors, so they don’t overshadow the actual data, and also allows the gridlines to show through. Select the secondary (top) horizontal axis and press Ctrl+1. In the formatting dialog or task pane, change the Axis Type to Date Axis. This changes the diagonal lines between adjacent shaded regions into vertical lines. 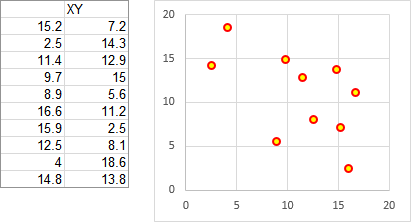 Select the secondary (top) horizontal axis, and press Delete. Then select the secondary (right) vertical axis and press Delete. Finally, rescale both axes as appropriate. For this example, both should have a minimum of 0, a maximum of 20, and a major unit of 5. Finally, delete the legend, and the chart is finished. Once you know the approach, it is not hard to expand the grid to 3-by-3. In the table below I’ve lightened the zero values to enhance the data for the shaded areas. In fact, you can use any reasonable (i.e., visually and cognitively useful) number of shaded areas, and you don’t need the same number of rows and columns of colors. It’s also easy to highlight a target region, especially since you only need the bottom area and the target area. Here is the chart right after all of the secondary axis series have been converted to Stacked Area type. The “bottom” series seems to be on top of all of the rest of the series, which is pretty strange. If we delete the “bottom” series, the “lower left” series has disappeared from the lower left region of the chart and now it is seen on top of the chart. Broken! So what’s going on, anyway? Let’s start with only the “lower left” series, in the position we want it: the bottom left portion of the filled regions. Look what happens when we move the category (horizontal) axis to the top of the chart, where the secondary category axis is found. 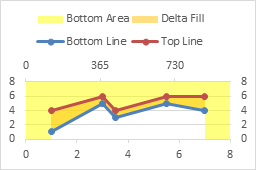 Instead of filling below the “lower left” data points, the fill is above these points. Aha! 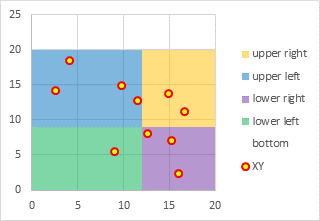 In an area chart, the first series fills between the category axis and the data points. So let’s start with the “bottom” series, with values of zero. 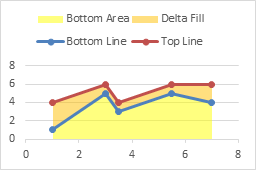 The “bottom” series starts from the category axis at the top of the chart, explaining why it appeared above the other areas, and extends to the bottom of the chart, or actually, to zero on the value (vertical) axis. Let’s now add the “lower left” series, nearly transparent so we can see both series. 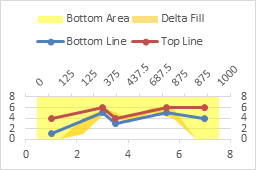 The “lower left” values are added to the “bottom” values, so it fills below its data points, in front of the “bottom” area. They all stack up nicely in front of the “bottom” series. Nice, just what we wanted. Back to the non-transparent version that brought us here. You may now return to the protocol. Posted: Wednesday, August 28th, 2013 under Chart Types. Tags: area-xy combo, Combination Charts. 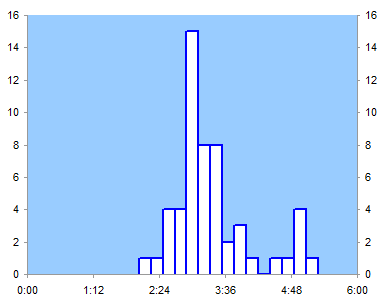 I recently showed how to create Histograms Using Excel XY Charts. This technique produces a human-friendly numerical X axis scale, which is easier to read and harder to be deceived by than the bin labels used by column chart histograms. 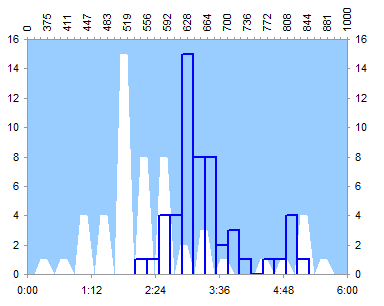 The drawback of that technique is that it produces histogram bars in outline only, without a fill color. 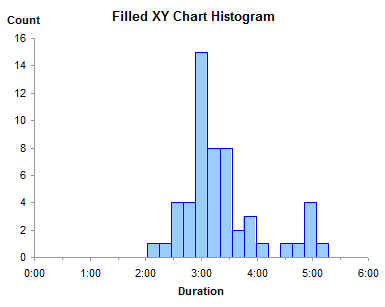 In this post I will show how to extend that technique to fill the bars, using the protocol from Fill Below an XY Chart Series with an XY-Area Combination Chart. 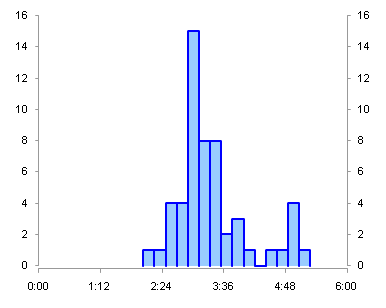 I started with the data from Histograms Using Excel XY Charts. I added a row at the top of the data for the left edge of the chart, and another row at the bottom for the right edge of the chart. 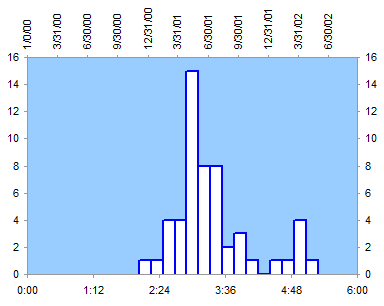 I inserted a column between the Time and Count columns, containing calculated X values for the area chart that will provide the fill color. We need to use both XY and Area chart types. 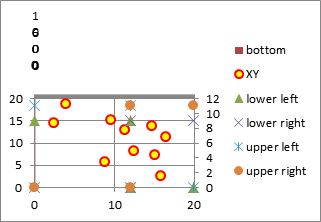 The XY chart series provides the X axis formatting and border, and the Area chart series provides the fill. 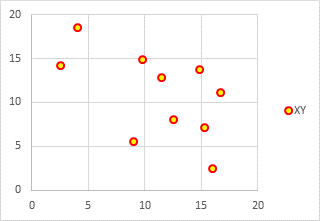 If we just used an area chart, the time points would be equally spaced, so the points at the same time would not occur at the same X position, but at consecutive positions. There would be no vertical lines between bars; instead the bars would be shaped like trapezoids. When we convert this axis to a date type, all the times are less than one (dates are whole numbers, remember, and times are fractions). 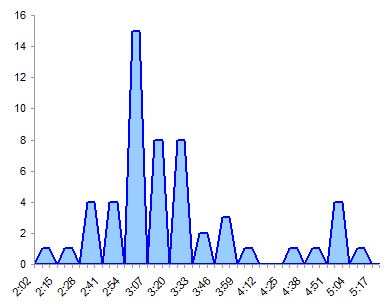 The date axis treats days as whole number values, spaced according to their values, and ignores any times. Since the times occur within the same day (day zero), they occur along the vertical line at day zero, or January 0, 1900. To get the area series to look like bars with vertical sides, we need the times to be some integer multiple, hence our calculated values in the middle column. Note: In cases where your bin boundaries are all integers, you can get away with using an area chart series without the XY chart series needed for the borders of the bars and for the axis. 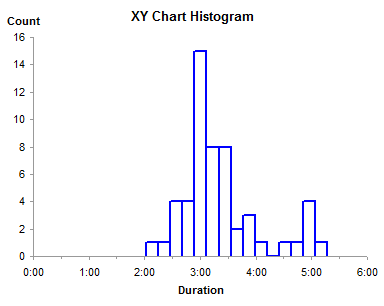 Simply use the protocol in Histograms Using Excel XY Charts with an area chart, and format both the fill and border of the area chart series as desired. So let’s make the chart. Select the Time values and Counts in the first and third columns, not including the added first and last row, and create an XY chart. (Use Ctrl+Click to select multiple regions.) 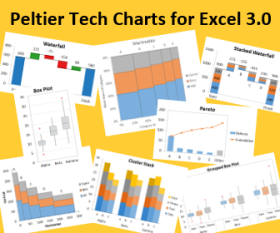 With one exception, these are the Excel 2003 version charts, but the Excel 2007 charts look the same, and with one exception, the steps are the same. Copy the Area and Counts in the second and third columns, including the first and last row. Select the chart, and use Paste Special to add the data as a new series, categories in first column. Since the new X values are so much larger than the old, the first series is squashed against the left hand axis. Format the new series so it appears on the secondary axis. 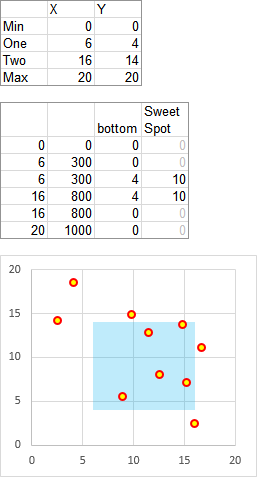 Excel adds only the secondary vertical axis, so we need to add the secondary horizontal axis. 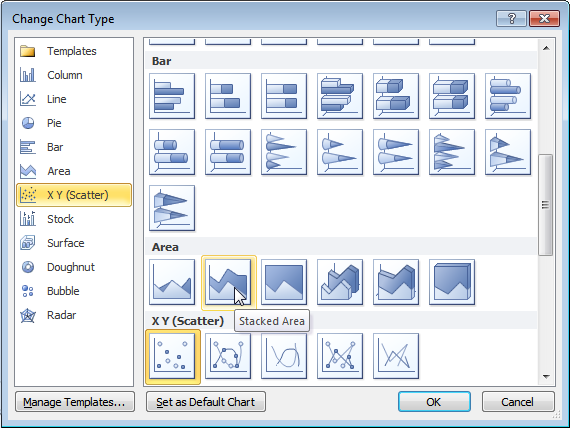 In Excel 2007, go to Chart Tools > Layout tab > Axes; in Excle 2003, go to Chart menu > Chart Options > Axes tab. The first axis makes its reappearance. Convert the second series (red lines above) to an area type (colored in light blue with no border below). 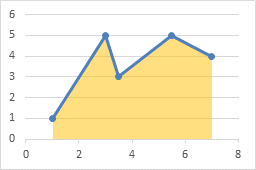 Convert the secondary horizontal axis to a date scale axis. 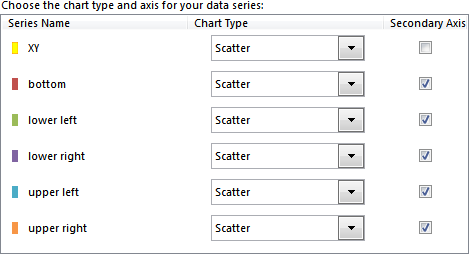 Excel 2007: right click on the axis and select Format Axis; Excel 2003: go to Chart menu > Chart Options > Axes tab. It’s filled above the lines, not below, but we’ll take care of that shortly. Format the secondary horizontal axis so it is hidden. No line, tick marks, or tick labels. In Excel 2003 you need to format the secondary vertical axis to make the secondary horizontal axis cross at the bottom. Uncheck the Axis Crosses At Maximum Value box. 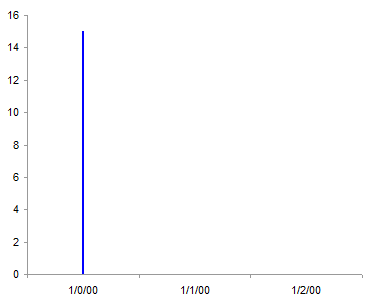 The Excel 2007 chart is still filled light blue above the line. Select the secondary vertical axis, and press Delete. The Excel 2003 chart is filled below the line, so all we need to do is hide the secondary vertical axis (no line, no tick marks, no tick labels) or delete it. 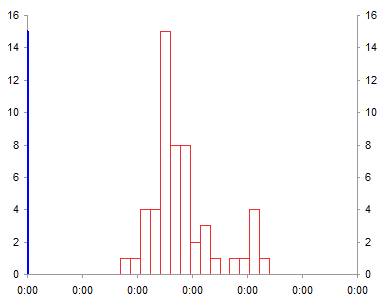 Format your X axis with human-friendly scale parameters, add a few titles, et voilà! Oh yeah, I used a thicker line when the histogram was unfilled, but with it filled, you can use a thin line for the borders of the bars. There is a slight misalignment of area and XY series in the exported Excel 2003 chart, evidenced by the sliver of white in a couple of the bars. 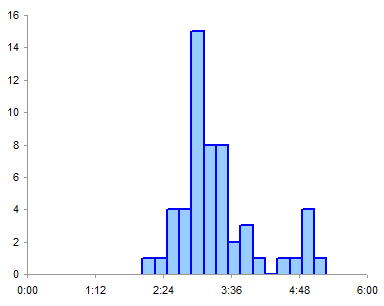 This does not appear in the actual chart, only in the exported image. Excel 2007 does not exhibit this problem. If I worried about it, I could probably fudge the formula used to compute the area chart’s X values. Perhaps adding 1 to all the calculated values except in the first and last (highlighted) rows would do the trick, or using a larger scaling factor (10,000 rather than 1000), and nobody’d be any the wiser. To me this is much less aggravating than the gap at the bottom of the Excel 2007 chart I had a mini-rant about earlier, because there is no teeny fudge factor that makes that misalignment go away, other than the scorched-earth approach of deleting the vertical axis. Posted: Wednesday, February 16th, 2011 under Chart Types. 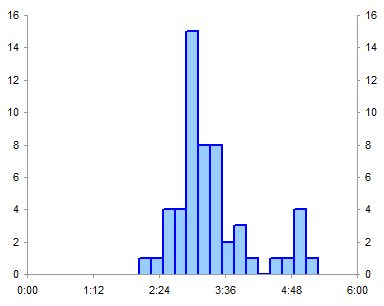 Tags: area-xy combo, Histograms, Statistics. Today’s post is written by David Montgomery, who has a new blog called David @ Work. David read two of my recent posts, Fill Below an XY Chart Series (XY-Area Combo Chart) and Fill Between XY Chart Series (XY-Area Combo Chart), and noted the lack of an explanation for different colors between XY series that cross. 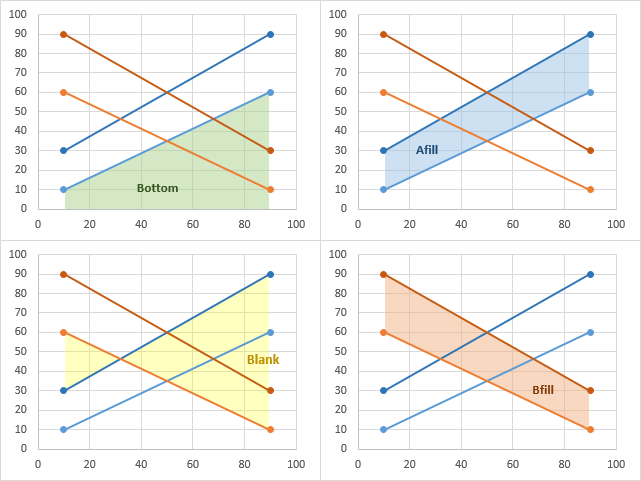 David attacked the problem in his blog post Two Color XY -Area Combo Chart, and he has graciously accepted my offer to repost his article below. Download the workbook at the end of this post. Plug in your data values. But if you’re like me, and I know I am, chances are you’re reading this blog because you want to learn how to do it yourself. At this time I should note that Excel 2003 and I have a monogamous relationship and that some of these steps may be different for other versions of Excel. Okay, so the first thing that is obvious is that you’ll need to add another data series if you want an additional color. Creating separate positive and negative data series doesn’t work by itself though; you need your positive and negative shading to end where the lines intersect, but the shading will continue on to the next point on the x-axis with the current configuration. 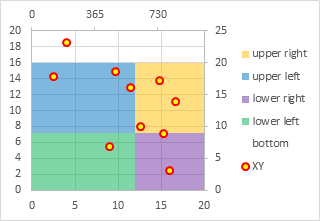 What we need to do is find the x values at the points where the lines intersect and add them to our secondary x-axis (just a recap, the lines are on the primary x-axis, the shading on the secondary x-axis). Our two y-axis intercepts are calculated in the exact same way, just replace SLOPE with INTERCEPT. We’ll need to calculate the slope and intercept for both line segments at every point where the lines cross. If the lines don’t cross, we can skip the calculation. Of course the formulas in the workbook are much uglier because I’m counting ROWS() and using the OFFSET() formula so I don’t have to manually add each line segment from the original data set, but it’s a little hard(er) to follow. Another trick to avoid manually entering each formula would be to insert blank cells between your original points in D4:F11. That way the original secondary x-axis and the new one in column G will be the same size and your formulas should copy down correctly. So to recap, our new secondary x-axis should look something like column G. You still run from 0 to 1000, you still repeat the first and last value, and every other point is one of the original points as calculated in Jon’s original post. The points in between are #N/A errors if the lines don’t cross and the x values we just calculated for the points of intersection if the lines do cross. An easy way to tell if the lines cross? In column F we had previously calculated the difference between the two original data series. If the product of any two adjacent points in column F is negative, the lines intersect between those two points. You should be able to add an IF() checking this at each potential point of intersection without too much trouble. The next step is to rebuild the three Area data series. Area1 is the transparent base series, Area2 is the positive series, and Area3 is the new negative series. You could also use the points C4:C5 for your y values as both line formulas will give the same result with that x value (G5). Now you just need to add these new data series to the chart. Series 1 and 2 are the lines which should already be done, Series 3 (the transparent series) should now point to h2:h20, Series 4 (the positive series) should point to the values in column I, and you’ll have to add a Series 5 (negative) to point to the values in column J. 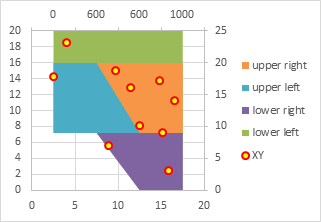 The secondary x-axis values also need to be changed to the values in column G.
If your Series 5 didn’t default over to the secondary axes, you’ll have to switch it. Double click on Series 5, click on the “Axis” tab, and select the “Secondary axis” option. Finally, double click on each area series, go to the “Patterns” tab, choose the two colors you think are the prettiest, and you’re all set. And that’s all there is to it. Let me know what you think in the comments. Posted: Wednesday, October 7th, 2009 under Combination Charts. Tags: area-xy combo, Guest Post.